Provide comfort for the family of Edmund Kubeck with a meaningful gesture of sympathy. Edmund P. Kubeck, 94, loving husband of Henrietta Bogacz Kubeck passed away peacefully on Saturday, March 9, 2019. Born in Wallingford, CT on January 18, 1925, he was the son of the late Thomas and Frances Okolotowicz Kubeck. Ed resided in Meriden most of his life and attended Wallingford schools. Mr. Kubeck was employed by Preisner Silver Co. and Valeria Albarello for many years prior to his retirement. He was a parishioner of St. Stanislaus Church. Ed was an avid golfer, enjoyed his walks and trips to the casino and enjoyed the beach at the Westbrook Elks. 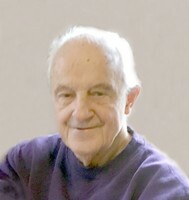 Besides his wife Henrietta, happily married for 69 years, he his survived by his three daughters, Diane Kubeck, Marie (Peter) Hoydilla and Carol Dumouchel; his son, Thomas (Michele) Kubeck of Lexington, KY; six grandchildren, Alexis Logsdon, Sean, Daniel and TJ Kubeck and Tyler and Kyle Dumouchel; four great-grandchildren, Emma, Madeline, Ryan and Graham. He is also survived by several nieces, nephews, cousins and his very caring neighbors, Nic, Sandie and Mac. Ed was predeceased by his son-in-law, Louis Dumouchel, two sisters and six brothers. Relatives and friends are invited to attend a Mass of Christian Burial to be held on Friday, March 15th at 10 a.m. at St. Stanislaus Church. Everyone is asked to meet directly at church. Burial will follow in St. Stanislaus Cemetery. Friends may call at the John J. Ferry & Sons Funeral Home, 88 E. Main St., Meriden on Thursday, March 14th from 4 to 7 p.m. In lieu of flowers, contributions in Ed’s memory may be made to the American Cancer Society 38 Richards Avenue, Norwalk, CT 06854 or to CT Baptist Home 292 Thorpe Ave # 1, Meriden, CT 06450 For online condolences, please visit jferryfh.com. To plant a memorial tree in honor of Edmund P. Kubeck, please visit our Heartfelt Sympathies Store. RIP!! I always admired how much you cared and watched over your wife.